Key project participants and more than a hundred journalists from Russia, India and other countries arrive to the ceremony of transfer of the INS Vikramaditya aircraft carrier to the Indian Navy. 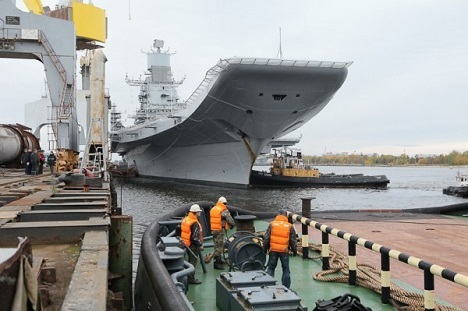 The Admiral Gorshkov, which is now known as the INS Vikramaditya, will be handed over to the Indian Navy on Saturday, November 16. The crew of the aircraft carrier and its commissioning team are completing their final preparations for the transfer. The handover ceremony “will be held rain or shine,” the Sevmash shipyard authorities told us. The Indian Navy’s state of the art aircraft carrier is at the shipyard in Severodvinsk. We had an opportunity to inspect the refurbished ship inside and out and were accompanied on board by the commissioning engineer Roman Khviyuzov and members of the Indian crew. Today in Severodvinsk, the temperature is around zero degrees. There is frost at night and in the morning, the snow falls and in the middle of the day and late in the afternoon there are occasional drizzles. The Indian crewmembers and the Russian sailors are not affected by this change of weather. For many days, they have been rehearsing their solemn ceremony at the waterfront factory where the aircraft carrier is moored. It is here, where the official part of the ceremony will begin with the receiving of the guests. It will continue on the summer deck of the ship, where flags of India and Russia will be raised and the relevant documents will be signed. Deputy Prime Minister Dmitry Rogozin is expected to lead the Russian delegation, on the Indian side it is India’s Defence Minister A K Antony. Now on the flight deck there is the anti-skid coatings are getting a touch-up, as they were used for the training take-offs and landings of the decked MiGs in August and September in the Barents Sea. At that time, 57 flights were completed, including 47, which involved landing on the aircraft carrier. A special achievement was 12 landings and take-offs at night, which had not been practiced by the Russian carrier-based aircraft. In the aviation hangar, which is now free while the Vikramaditya is transferred to Indian shores, there is a different kind of preparation going on. As expected, on November 16, immediately after the signing of transfer of the aircraft carrier, there will be an international press conference with the Minister of Defense and Chief of the Naval Forces of India, among the Russian counterparts, as well as the Ambassador of India in Moscow. Sevmash spokesperson Yekaterina Pilikina and her colleagues at the United Shipbuilding Corporation (USC) say more than a hundred journalists and media professionals have been accredited for the ceremony of transfer of the ship – mainly from Russia and India. A large number has already arrived in Severodvinsk and started their work.